The procedure lamination hair helps restore damaged hair, making it silky and smooth. The cost of lamination depends on three factors: the length of the hair, their condition and model of used vehicles. The procedure lamination hair gives hair a healthy and glossy look. The hair becomes shiny, smooth and silky. This procedure is recommended to be performed regularly to achieve the greatest effect. Especially in need of dry, brittle hair. Lamination of hair you can make not only in salon but also at home. The essence of the lamination – wrapping hair wrap that seals the irregularities and roughness of hair. 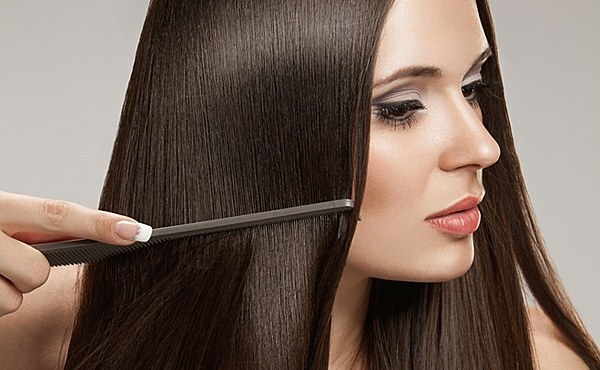 This procedure is very useful for hair. After lamination the hair is easier to style, more manageable. Hair, which struck the laminate, when heated with a Hairdryer remembers the form that it is given, and the need of fixation disappears. At home laminating cost will be much cheaper than salon because of the volume of solutions will suffice for some applications. Typically, the procedure consists of preparing a shampoo, a special solution to open the hair scales, hydrating mask, means to close the scales and balsam. The effect lasts from three to five weeks, so if you have decided to paint hair – it is best to do it in advance because the hair after lamination become as though sealed and coloring pigments, it is simply difficult to get inside. The whole set of formulations can be bought for 3-7 thousand rubles, the cost varies depending on brand of media. For example, a set of company Hair Company can be purchased for 3 thousand rubles., slightly more expensive cost of funds from the company Lеbel and Paul Mitchel. The premium class is firm Sebastian Laminates. The cost of a set for lamination of this brand is not less than 7 thousand RUB. You can spend economy lamination with gelatin mask. It will bring not only beauty to the hair, but it will be very useful. If the hair is in normal condition, the effect will be very pronounced if they are severely depleted or burned paint, permed – it is better to consult a professional or to resort to services of beauty salons. For the gelatin mask you will need (depending on hair length) 3-5 packs of gelatin (60-100 rubles), water and a towel. Dilute the gelatine and, when it is the consistency to resemble a jelly, you need to put it on pre-washed hair. Next, you should wrap the head and keep the mask for an hour and a half. Then rinse and apply a nourishing balm. The cost of the lamination from the master varies from 2 thousand up to 7 thousand rubles., depending again on length of hair, their condition and the brand of the means used and the cost of the wizard. Economical alternative to full lamination of hair spray Express laminate. The cost of 250 ml - from 700 to 1 thousand rubles. The average prices for the lamination process are the following: short hair 1, 3 thousand rubles., average – 1, 5 thousand rubles., long – 1, 8 thousand. Lamination will give your hair luster, noticeable amount, persistent and intense color-treated hair. The procedure is quite expensive, but in General, reviews in most cases, positive and even enthusiastic. So you should at least once in your life to try. For the first time, it is better to go to the master, and then, if you like, you can learn to do lamination in the home, that will save your budget.